The Resident Evil games are great but it's hard to believe this is the fourth film they've spawned. 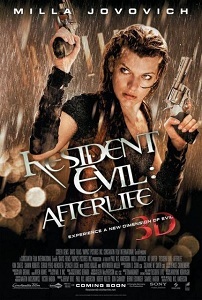 Afterlife is a 3D outing and it is pure frenetic action all the way. There's plenty of zombie and mutant slaying to keep you entertained but don't expect character development, a decent plot, good dialogue, acting or any real horror. In this instalment Alice (Jovovich) meets up with a small band of survivors keen to reach the supposed haven of Arcadia. It's predictable stuff so just switch off your brain, sit back and enjoy the fast-paced CG nonsense (ideally in 3D) as body parts fly and blood spatters the screen.